Provocative, moving, powerful, explicit, strong, unapologetic. These are a few words that have been used to describe the groundbreaking Brooklyn-based dance troupe Urban Bush Women. Their unique aesthetic borrows from classical and contemporary dance techniques and theater characterization exercises, incorporates breath and vocalization, and employs space and movement to instill their performances with emotion and purpose. 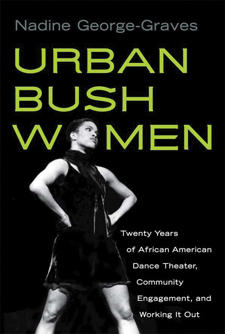 Urban Bush Women concerts are also deeply rooted in community activism, using socially conscious performances in places around the country— from the Kennedy Center, the Lincoln Center, and the Joyce, to community centers and school auditoriums— to inspire audience members to engage in neighborhood change and challenge stereotypes of gender, race, and class. Nadine George-Graves presents a comprehensive history of Urban Bush Women since their founding in 1984. She analyzes their complex work, drawing on interviews with current and former dancers and her own observation of and participation in Urban Bush Women rehearsals. This illustrated book captures the grace and power of the dancers in motion and provides an absorbing look at an innovative company that continues to raise the bar for socially conscious dance. Nadine George-Graves is associate professor in the Department of Theater and Dance and affiliate faculty in African American studies, ethnic studies, and critical gender studies at the University of California, San Diego.